Learning Welsh has never been easier. Buy Now! Cwrs Mynediad is a beginners course for adults learning Welsh (level A1). 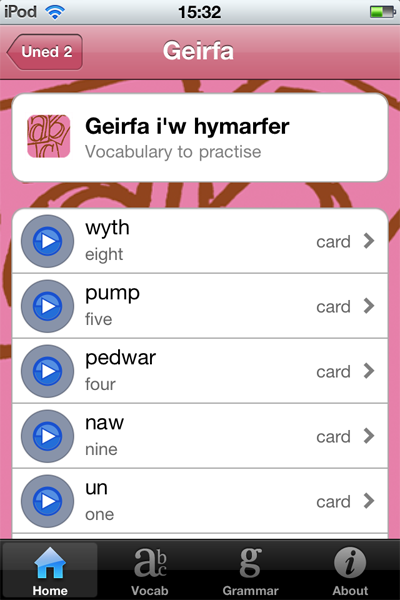 The iOS and Android apps contain both the North and South Wales dialects of Welsh in one app. This beginners Welsh course, created by Aberystwyth University using the content from WJEC's popular course book 'Cwrs Mynediad', contains 30 expertly designed units including greetings and introductions, discussing time, speaking about family, discussing the weather and interests, dealing with money and pronunciation. Cwrs Mynediad identifies the most common every day situations in life and will teach you to take part in discussions fluently. The Welsh audio examples and exercises will help you to improve your pronunciation so that you are clearly understood. Created by Aberystywth University using content from WJEC's popular course book 'Cwrs Mynediad'. This is the perfect complement if you're already using the book in class. Unlike traditional classes, you will be able to learn Welsh at any time and in any place - that means you could be learning Welsh in the Amazon rainforest or even on the Moon! 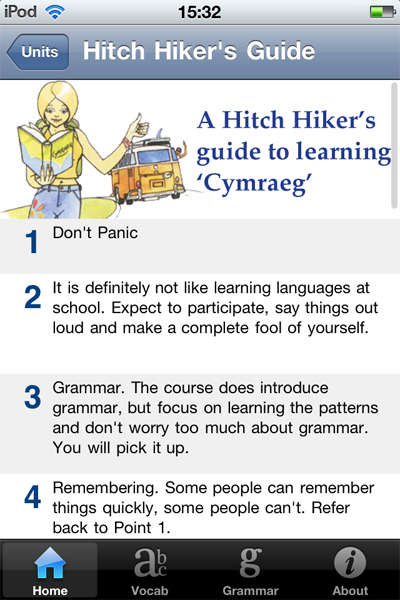 You will learn Welsh through different real life situations, forget about the grammar for now, you'll soon pick it up! The aim of this course is to learn Welsh that you can easily use when out in the real world. This course will help you to speak in Welsh, not just read, write and listen in it. You'll hear and read examples of Welsh so you can practise your pronunciation so you are effortlessley understood by native Welsh speakers. "This is the best app on the store that I have come across. Great units introducing a great range of skills. Using listening, reading, speaking, translating to help you remember. They even provide a small script to practice"
"This app is absolutely fantastic & does exactly what it says on the tin. Not only that but the developers are absolutely brilliant in terms of support. Job well done - best app I own by far! " "An excellent piece of work. Very easy to use, and very dependable. " ".. It's really helping me with the pronunciation, love how you can record yourself and compare, go back and try again until you get it. Great for iPhone as the units are short and can be done over coffee break .. I am really pleased and can't wait to surprise my Welsh-speaking grandchildren. " © 2010-16 Cwrs Mynediad. 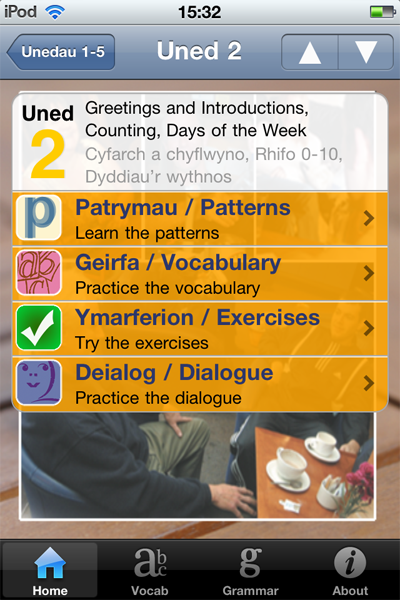 Learn Welsh on the go. Welsh Learning.